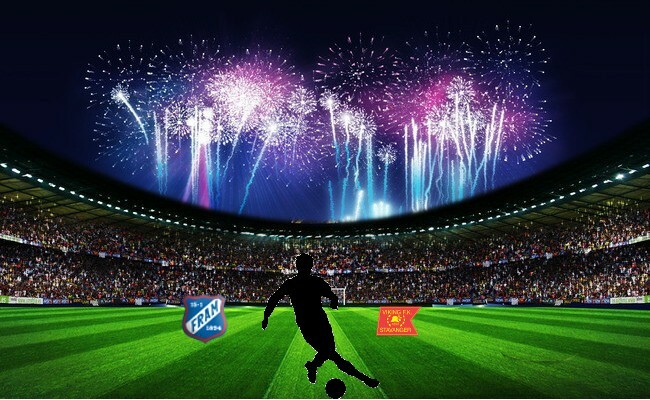 Another season is on the way, and you can feel the excitement in the air around Fram Stadion. The odds of having another great season is still not the best, but the guys will keep on fighting for their manager and for the club. The fans were very disappointed about this, but it was nothing Patrick Johansen could do, cause the club needs the money. Not the best start of this season, but it's plenty of games left. 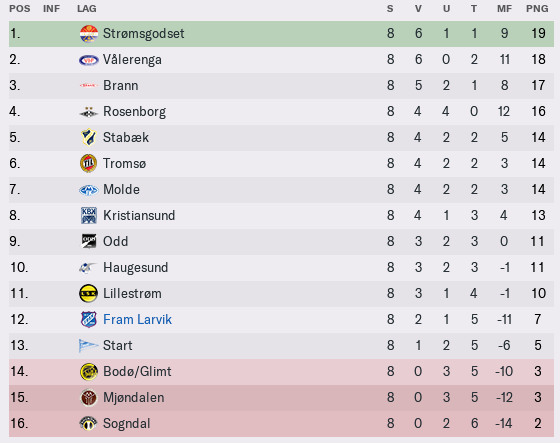 Halfway in the season, and it is turning out to be a decent season. The injury situation looks good, with only 1 player out at the moment. WOW. 9 games and 9 victories. The best streak since Patrick Johansen took over the club. The game against Start seems to be a very very important one! Zachariassen proved to be the right Striker choice this evening. 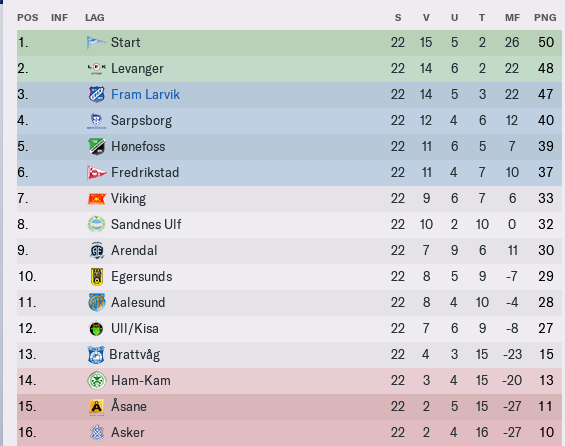 A real turnaround in fortune there has been a huge boost to your league position. A shame that the club can't afford to keep hold of their stars, but unfortunately that's the way things go for clubs like Fram, it seems. A great first 15 games, now just a case of building on that and pushing for promotion! 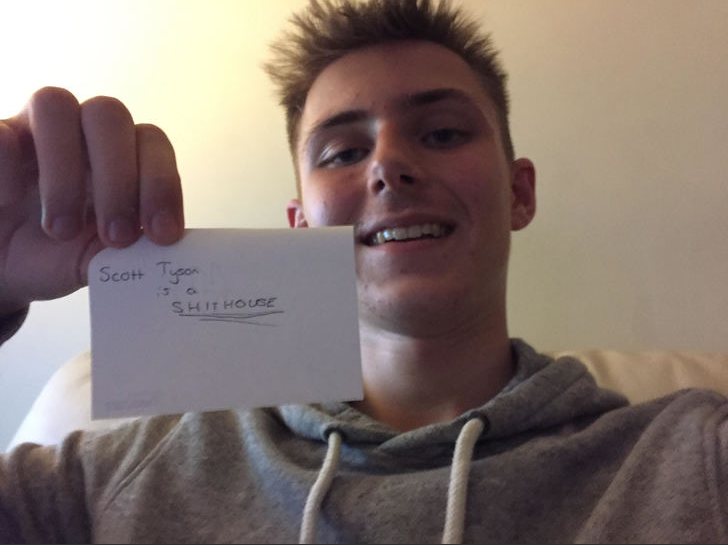 ScottT - Yeah I know. Very annoying, but you're right. It's just how it is for the smaller clubs..
A strong league showing in recent games, hopefully top spot drops off and you can catch them! Finally back in the top division. This will be the toughest season so far, and now we can see what the boys are made of. One of the best players left Fram Larvik for free, sadly! but a lot of good players have come in. 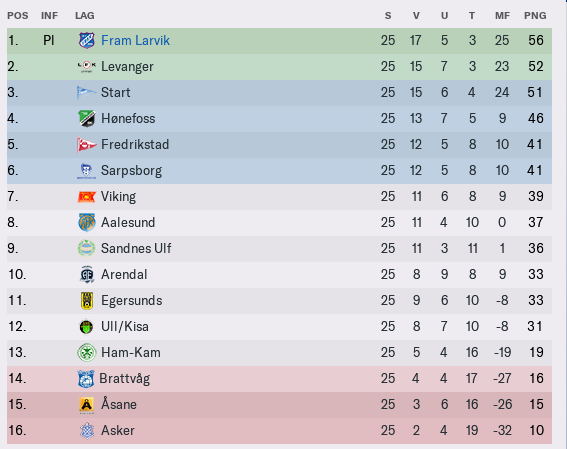 Still early in the season, but it's clear that Fram Larvik will fight hard to not get relegated this season..
Congrats on reaching the top division! It'll be a challenge to fight for top spots straight away but you've taken every other challenge in your stride so far! Mgriffin2012 - Thanks! Yeah I'm expecting to be relegated to be honest. 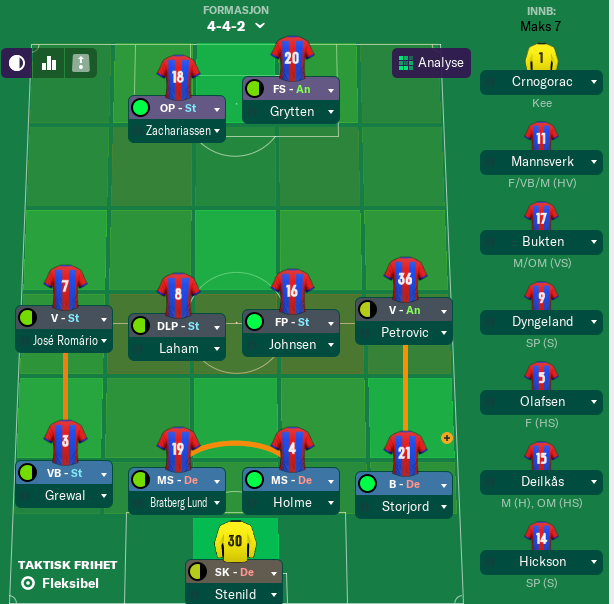 Just need more time to build up the team. It'll be a real battle to survive this season, so getting points here and there is vital. Things have started decently in your quest to do that, so hopefully that can continue. I can imagine the club's reputation is much lower than everyone else's, along with finances. ScottT - yes indeed! it is much lower, and the money is not really there.. haha! I think I'm also in debt atm. 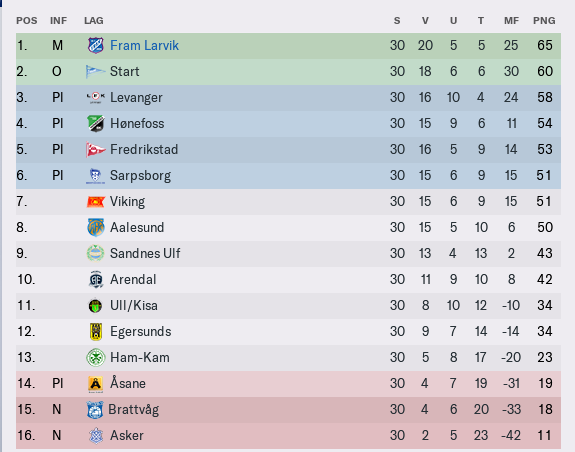 After a horrible form, Fram Larvik is last in the league, with only 10 points in 15 games. 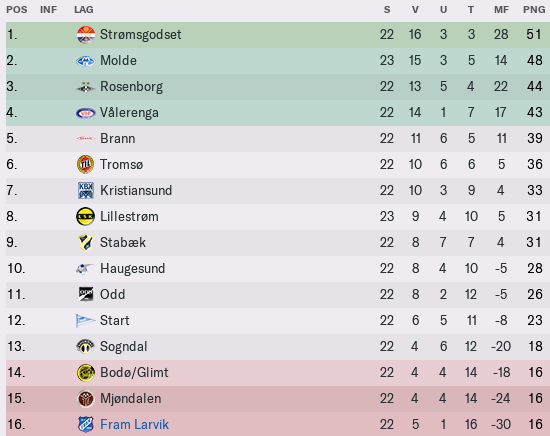 Still with a bad form, the 3-2 victory against Rosenborg was a big surprise, and the best result for Patrick Johansen in his career. 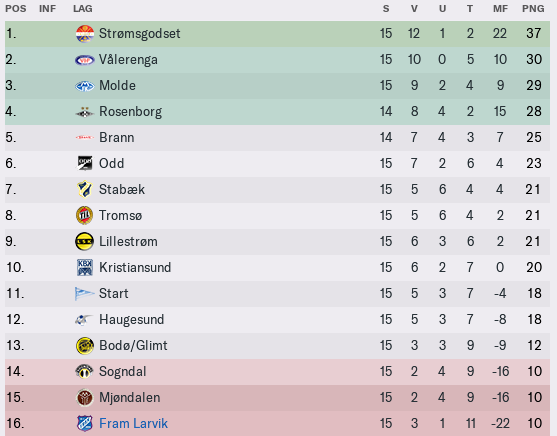 The spot for a new season in Tippeligaen is not yet secured. Fram Larvik have to play a qualifying against Arendal from Obos-Ligaen. 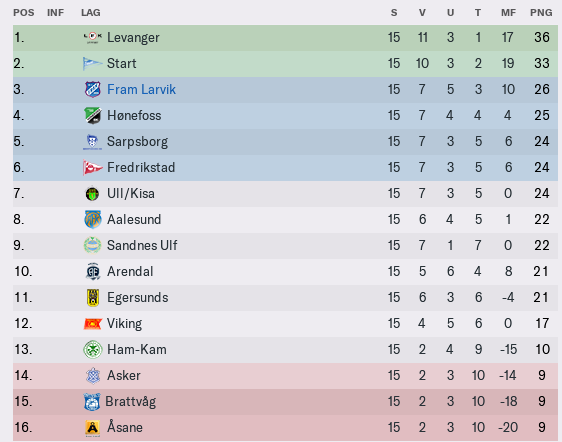 It's amazing how the team from Larvik still have a chance to survive with only getting 25 points this season. 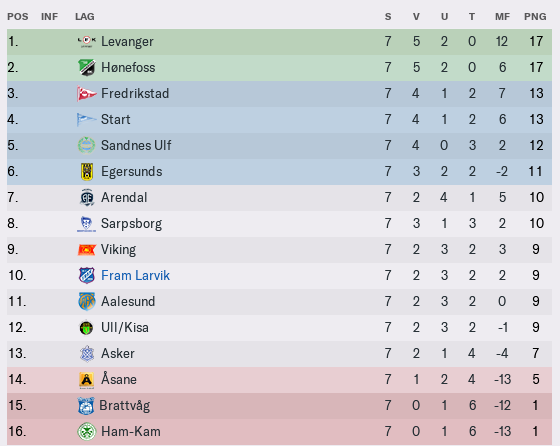 The first one should have been a clear victory, specially after Arendal got reduced to 10 men after only 28 minutes. So so close. Fram Larvik were in real trouble, they were behind 0-2 after 15 minutes. 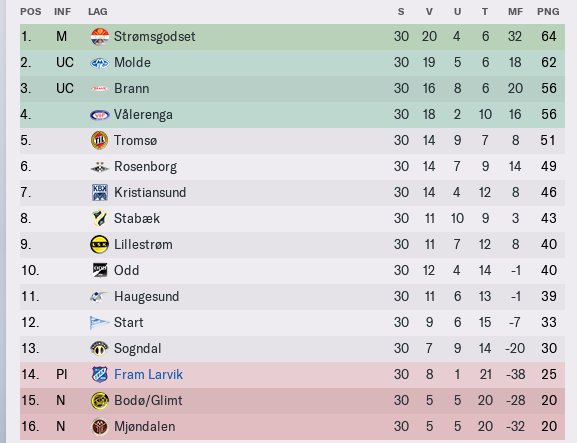 A strong second half secured them another season in Tippeligaen. By the skin of your teeth but survival is survival at the end of the day! It is a platform to build on for next season. Staying up is a momentous achievement in this clubs history, onwards and upwards from here!